Superb Condition, ONLY 33,183 Miles! EPA 24 MPG Hwy/17 MPG City! Heated Leather Seats, iPod/MP3 Input, All Wheel Drive, CD Player CLICK ME! KEY FEATURES INCLUDE All Wheel Drive, iPod/MP3 Input, CD Player, Aluminum Wheels, Brake Actuated Limited Slip Differential BMW xDrive30i with Monaco Blue Metallic exterior and Saddle Brown interior features a Straight 6 Cylinder Engine with 260 HP at 6600 RPM*. OPTION PACKAGES PREMIUM PKG Nevada leather seat trim, universal garage door opener, auto-dimming pwr folding exterior mirrors w/memory, auto-dimming rear view mirror w/compass, multi-contour front seats w/4-way pwr lumbar, BMW Assist, Bluetooth interface, BMW ambiance lighting, storage pkg, panorama roof, HEATED FRONT SEATS, PRIVACY GLASS, HEATED STEERING WHEEL, 6-SPEED STEPTRONIC AUTOMATIC TRANSMISSION adaptive transmission control, normal mode, sport mode, manual mode. Rear Spoiler, MP3 Player, Keyless Entry, Steering Wheel Controls, Child Safety Locks. Serviced here, Non-Smoker vehicle, Originally bought here. EXPERTS REPORT Bigger exterior means a more spacious X3, higher-quality interior; silky turbocharged six is newly available; body motions are well controlled and smooth eight-speed auto ups efficiency. -CarAndDriver.com. Pricing analysis performed on 4/8/2019. Horsepower calculations based on trim engine configuration. Fuel economy calculations based on original manufacturer data for trim engine configuration. Please confirm the accuracy of the included equipment by calling us prior to purchase. CARFAX 1-Owner, Excellent Condition. REDUCED FROM $28,900! Moonroof, Heated Seats, Navigation, Turbo Charged, iPod/MP3 Input, All Wheel Drive, Dual Zone A/C, Brake Actuated Limited Slip Differential, Power Liftgate, XLINE CLICK ME! KEY FEATURES INCLUDE Sunroof, All Wheel Drive, Power Liftgate, Turbocharged, iPod/MP3 Input, Dual Zone A/C, Brake Actuated Limited Slip Differential Privacy Glass, Child Safety Locks, Steering Wheel Controls, Electronic Stability Control, Electrochromic rearview mirror. OPTION PACKAGES PREMIUM PACKAGE Satellite Radio, Comfort Access Keyless Entry, Lumbar Support, NAVIGATION SYSTEM Remote Services, Advanced Real-Time Traffic Information, BMW Online, XLINE Dark Copper High-Gloss Trim, Wheels: 19 x 8.5 Light Alloy Y-Spoke (Style 608), xLine (7HW), COLD WEATHER PACKAGE Heated Front Seats, Heated Rear Seats, Heated Steering Wheel, Retractable Headlight Washers, harman/kardon SURROUND SOUND SYSTEM, DRIVER ASSISTANCE PACKAGE Rear View Camera, Park Distance Control, POWER FRONT BUCKET SEATS W/DRIVER SEAT MEMORY (STD). BMW xDrive35i with Glacier Silver Metallic exterior and Black Nevada Leather interior features a Straight 6 Cylinder Engine with 300 HP at 5800 RPM*. Serviced here, Non-Smoker vehicle, Originally bought here. EXPERTS ARE SAYING Edmunds.com's review says Distinctive design; powerful and fuel-efficient engines; comfortable ride; solid construction.. PRICED TO MOVE Was $28,900. 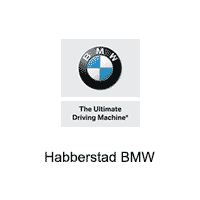 SHOP WITH CONFIDENCE CARFAX 1-Owner WHO WE ARE Habberstad BMW is Long Island's largest Certified Pre-Owned BMW Center & the #1 Customer Satisfaction Rated Center on Long Island! Our family owned business has served the Long Island community for over 30 years! We offer BMW loaner vehicles, 100,000 mile warranties Pricing analysis performed on 3/22/2019. Horsepower calculations based on trim engine configuration. Please confirm the accuracy of the included equipment by calling us prior to purchase.